Please contact our order department at 800-REX-ART2 (739-2782) for information regarding holiday shipments. December 16 Last day to order for shipments West of the Mississippi within the 48 contiguous United States for ground delivery. See Fedex Ground map for detailed shipping times. December 17 Last day to order for shipments East of the Mississippi within the 48 contiguous United States for ground delivery. 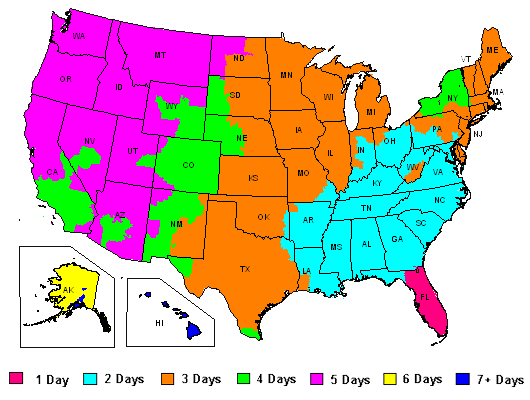 See Fedex Ground map for detailed shipping times. Last day to order items over the internet for delivery via USPS Priority Mail service. Last day to order items over the phone for delivery via USPS Priority Mail service. Last day to order items over the internet for delivery via Two-Day Air delivery. Last day to order items over the phone by 2pm EST for delivery via Two-Day Air delivery. Last day to order items over the internet for delivery via Next-Day Air delivery. December 23 Last day to order items over the phone by 2pm EST for delivery via Next-Day Air delivery. Orders placed during this time will arrive after Christmas, but you can still print a copy of the item and place it in a card. The recipient will be able to look forward to receiving a great gift in the mail! Gift Certificates placed after 9am EST on Dec 24th will not be processed until December 26th. December 25 & 26 No shipping these days. Happy Holidays! January 1 & 2 No shipping these days. Happy New Year! Please note: Some items may drop ship from the manufacturer. These items may require additional shipping times. If your order is time sensitive for Christmas, please let us know in your order notes and we will contact you if there will be shipping delays. Also, the above shipping schedule is based on the schedules published by Fedex and the USPS. We are not responsible for delays by Fedex or the USPS. Days indicated are business days. Please add one business day for processing of in stock orders.